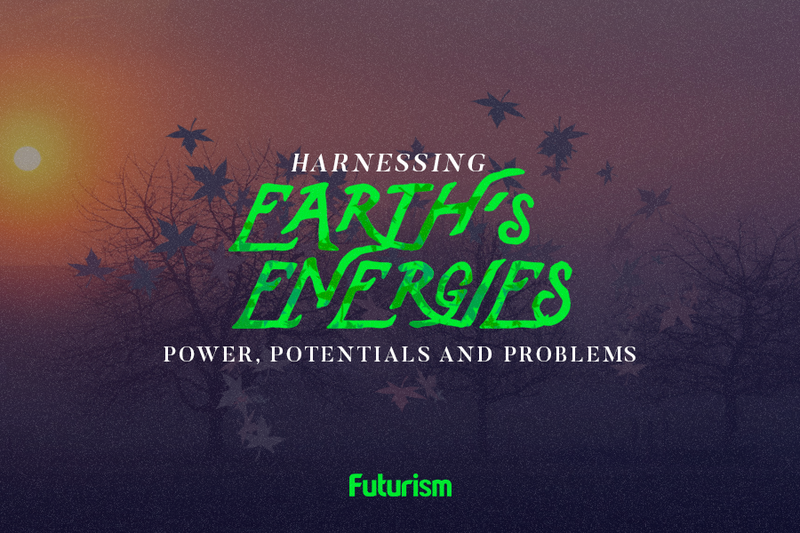 There's a new way to power the world. Estuaries are ecosystems constantly in flux — brackish bodies of water where fresh and ocean water meet and mix. These coastal “living laboratories” have long been of interest to scientists, and now researchers may have found a way to harness their power — literally. Researchers at Penn State have developed a new hybrid technology that merges the most effective pieces of existing methods for capturing energy created from differences in salt concentrations in water. This new blended process generates unprecedented amounts of electrical power in places where saltwater and freshwater meet. Until now, the most successful and commonly used method for seizing the energy from salt concentration differentials has been pressure retarded osmosis (PRO). PRO selectively lets water through a semi-permeable membrane while holding salt back and creating osmotic pressure that moves turbines, generating power. However, the membranes tend to clog up, and the method is less useful with extremely salty water. Reverse electrodialysis (RED), solves some of these issues by transporting salt through its membranes rather than water, but it generates only small amounts of power. The Penn State researchers solved the problems by creating an electrochemical flow cell that features both the RED and Capacitive mixing (CapMix) technologies. CapMix is a fairly new technique that draws energy from the voltage that is created when two electrodes are immersed in water whose salt concentration changes. 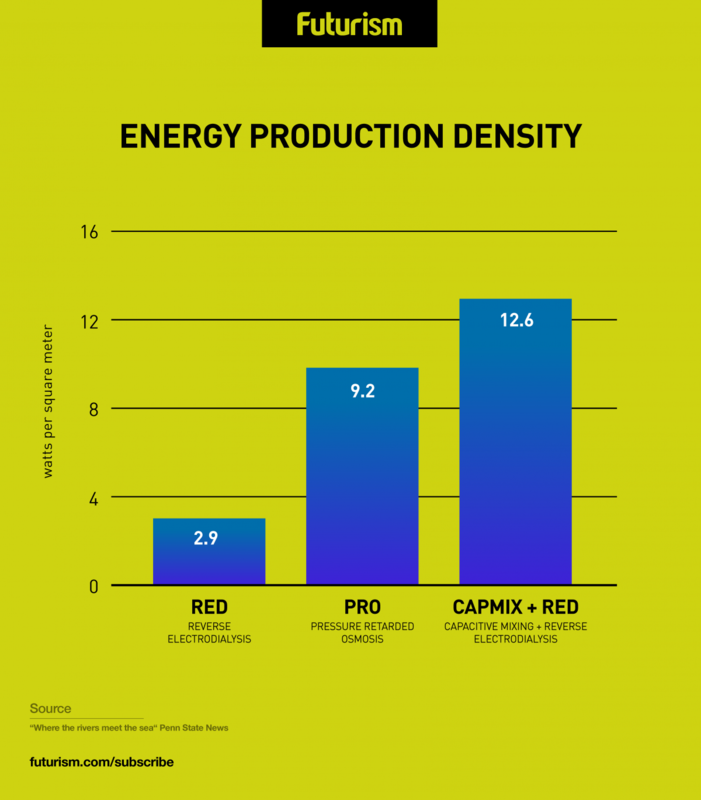 While CapMix yields too little power to be viable by itself, marrying it to the RED technology increased energy production efficiency by more than four times compared to RED alone — attaining a higher level of energy production density than even the PRO method. The researchers say that harnessing the difference in salt concentration with their technique has the potential to create energy sufficient to meet as much as 40 percent of the world’s electricity needs. Since a recent survey revealed that solar roofs could provide 25 percent of the energy used in the U.S., this technology could go a long way toward eliminating most of the country’s reliance on fossil fuels. If this technology is as efficient as this study suggests, countries would simply need to head to the coast to get the technology in place — assuming they could afford it. The Penn State team and other teams around the world have been working not only on perfecting the technologies, but also on keeping the price points low to ensure they’d be accessible to all. Although the results are promising, the work isn’t done yet. The researchers need to research how stable the electrodes remain over time. They also need to know how other seawater elements such as sulfate and magnesium could affect the cell’s performance. Hopefully they’ll see positive results from more long-term testing soon so this carbon-neutral energy source can be harnessed. As the U.S. moves toward further deregulating the fossil fuel industry, timing could be crucial. Use of Nuclear Power Is in Decline; Why?